In 2003, Southport Boats emerged to build a new kind of center-console boat. The Clean Air Act Amendments of 1992 were playing out in the marine power industry as outboard engine manufacturers developed four-stroke and direct-injected two-stroke models that greatly reduced air emissions, aiming for complete conversion of their products by the Act’s 2006 deadline. As we know now, these new-generation engines turned out to be not only cleaner, but smoother, quieter and much more fuel-efficient. But they are heavier and therefore created some balance problems on some hulls that had been designed for the lighter, old-style two-strokes. C. Raymond Hunt Associates to design two boats for them, a 26.5 by 9.5 footer and a 28.5 by 10.5 footer, to take advantage of the weight and power potential of the new-generation engines. As always, the Hunt firm delivered. The Southports are classically beautiful, with the subtly raised sheer, bow flare and raked, gently curving stem of traditional Carolina fishing boats, leading aft to reversed transoms set off by a touch of tumblehome in the topsides. Below the surface, the wide hulls rode on modified-V bottoms with broad chines and buttocks, lifting strakes, and 22 degrees of deadrise at the transom sharpening to the mid-30s amidships and about 46 degrees at the bow. At the transom, the shape of the hull is “chesty,” in the words of Southport managing director, Skip Robinson, and the weight of the engines actually helps plant it firmly in the water, even as the slippery shape allows it to run fast, soft and efficiently. Meanwhile, the hull’s carefully developed balance allows it to rise onto plane almost imperceptibly, without excessive bow rise and resulting compromised visibility for the skipper. Southport’s original owners also knew plenty about fiberglass construction, and they built their boats in the time-tested method with the open-mold, hand-layup systems of the time. True to form, the boats delivered on their promise and quickly gained a strong following, with dealers up and down the Atlantic Coast and in the Chesapeake. “The hulls hold the same shape,” Skip Robinson said in a recent conversation, “but the build processes are different, thanks to the broad expertise of our engineering team.” Indeed, a look at Southport’s website (www.southportboats.com) shows the changes, both large and small. First, Kenway offers great expertise in construction, maintenance and operation of the tooling (molds) used to build the hulls, stringer grids, interiors, deck caps, and consoles in fiberglass. The company also constantly searches for materials that offer strength with minimum weight, including both fabrics and synthetic core materials, as well as sophisticated resins and adhesives, which form powerful chemical bonds between these materials. One example is the way the company’s lamination crews fill the insides of the hull strakes with core material and then laminate fiberglass over them, providing additional longitudinal stiffness. The crews are also adept at laying up the hulls to reproduce the Hunt designs precisely, especially including sharp corners on the strakes and chines that contribute effectively to providing lift and damping spray. Yes, that Carolina flare in the Southports’ bows helps keep them dry, but not much water gets up that far because the strakes and chines direct it out and down. Another Kenway touch in Southport construction is the foam-filled stringer grid, a complex part that provides primary structural rigidity to the hull, along with secure locations for the fuel tank and batteries, plus deep molded grooves for wiring and plumbing chases. The hull, grid, interior and deck cap are bonded together under careful climate control in the plant, using super-strong Plexus adhesive. Seemingly small touches are important too. For example, each Southport has large, straight-pipe scuppers aft to allow any water to drain overboard, along with a rear-opening transom door that will allow any rogue green wave to flow out. Another feature is a range of well-rounded grab handles placed strategically where crewmembers would instinctively reach for them. A third is a door to the in-console head compartment that opens upward to make entry and exit easy, even for a full-sized adult. Details like these reflect the thinking of designers who have spent serious time afloat. 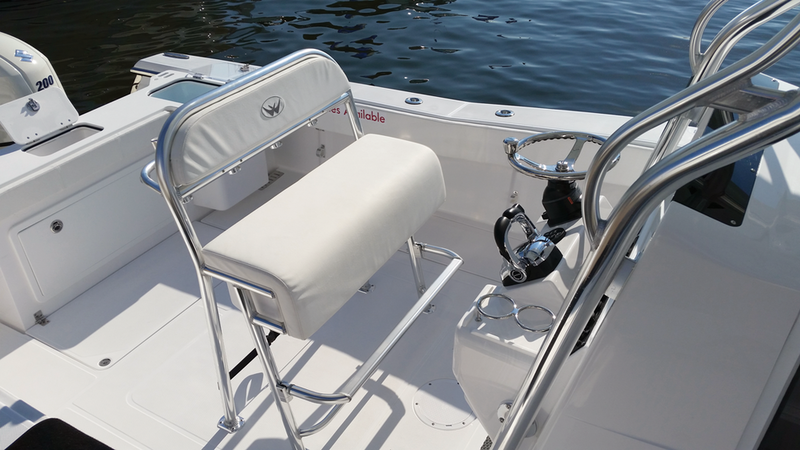 In 2014, in a move to reach a broader market and take advantage of larger outboards developed by Yamaha and Suzuki, Southport reconfigured the interior of the 29, dubbing it a 292, and they developed a new FE (Family Edition) model with port-and-starboard bow seating to go with the TE (Tournament Edition) hard-core fishing model. The big news, though, was an all-new 33 footer riding on another original Hunt hull. The 33 is also now available as an LX (Luxury) model with more family amenities and as an ST (Sport Tower) for serious blue-water angling. Twin 300- and 350-hp engines and even triple 300s are available to push these hulls to speeds well over 50 knots, but their superb balance allows them to stay on plane and ride comfortably at speeds as low as 20 when gnarly seas threaten. In 2015, in an effort to make a more affordable Southport, the company value-engineered the 272, building both an FE with bow seating and a TE with a large, cushioned coffin box forward for fishing gear or fish. There are multiple options available, but even the base model offers a simple, effective leaning post with rod holders, storage, and space underneath for a cooler. Plumbing is simplified and accessible under a large hatch in the transom. At 4,600 pounds dry and without power, the 272 models are light enough to run well with a pair of Suzuki or Yamaha 200s, a single 350 or even a single 300. Top speeds range from the low to upper 40s, with base prices in the range of $145,000 to $165,000. All combinations offer that same broad range of 20- to 35-knot safe cruising speeds, allowing their skippers to fit the ride to the conditions and the comfort of the crew. For most practical purposes on the Chesapeake, the two single engine models will serve well. Despite the economic challenges of its youth, Southport Boats endures today as a strong company, with the economic strength to search constantly for excellence in all facets of the seven current models. There might even be a new one on the drawing board. Stay tuned. . . . Note: North Point Yacht Sales will have a 272 on display at the Baltimore Boat Show, January 26–29.